Matthew Cleveland is being charged with home invasion robbery, felony battery by strangulation, and two counts of simple battery. PINELLAS PARK, Fla. -- (WPTV) -- "Brave" is how neighbors describe Alex McMaster, who fought off an intruder with an ax Wednesday. McMaster said he grabbed the first thing in sight when a complete stranger, a 17-year-old, busted through his front door and started choking and hitting his girlfriend. Pinellas Park Police tell us McMaster's girlfriend, Christina Robles, opened the door for Matthew Cleveland when he knocked on her condo door on 80th Avenue. Cleveland, a complete stranger, asked her for directions to a nearby park. When Robles tried to close the door, Cleveland pried the door open and started choking her. She yelled to McMaster, who was asleep upstairs, for help. "I held over him and I told him follow my commands and if he didn't then I'd go after him." McMaster first started punching Cleveland, then, he reached for the first thing in sight: a full-size ax. "It just so happened to be there. I had him by his throat and he was down. He looked away for a minute I went and grabbed it and then he really got scared because he was afraid I was gonna hit him," McMaster explained. 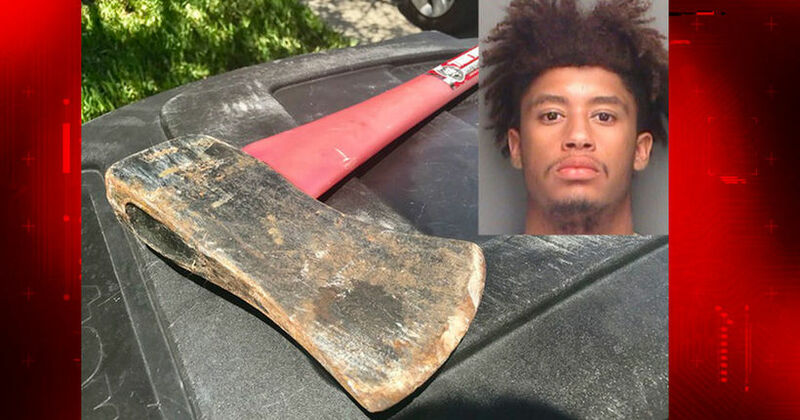 Instead, he held Cleveland with the ax for more than five minutes until Pinellas Park Police Officers arrived. "I just said 'Follow my commands and you'll be fine,' and he did," McMaster said with a slight chuckle. Only then did McMaster find out how bizarre it was that Cleveland was in his neighborhood in the first place! Officers say the high school senior walked nearly 3 miles to the condo complex, knocked on several doors, until he found someone who answered. "And that's the thing. If I wasn't home who knows what would have happened?" McMaster said. He only hopes the brazen thief learned his lesson by picking the wrong door, "Hopefully he got the message, probably not but hopefully he did." Cleveland is being charged with home invasion robbery, felony battery by strangulation, and two counts of simple battery. He's a senior at Richard L. Sanders High School.